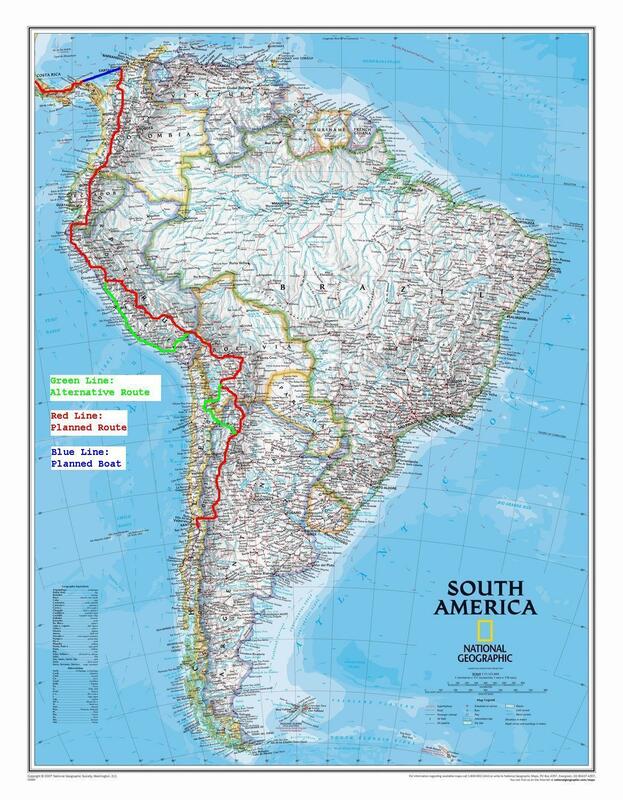 I’ve literally spent days looking at different maps of South America lately, researching possible routes, trying to find an approximate route to Central America without making too many detours and without killing to many darlings. There are endless opportunities (thank God) and I think I must have covered most of them mentally, with my find pointing at the colorful and enormously tempting SA map. Anyway, I’ve tried to visualize the route that – sitting here in Santiago, Chile at the foot of the Andes (snow covered, yes) at the “new” beginning of a new chapter in the book of WT – seems most likely. Everything can (and most possibly will) change along the way (thank God again). NB: And please let me do he worrying here. As always I do my homework in the world of route planning and would never enter a country or a region I didn’t feel comfortable with (either because of ugly road side guerilla bandits or aggressive Copacabana muchachas looking for blond Scandinavians). The world is so much nicer than it seems. Trust me. This entry was posted on Sunday, August 10th, 2008 at 8.25 am	and is filed under English, News. You can follow any responses to this entry through the RSS 2.0 feed. You can leave a response, or trackback from your own site. It looks like a mountain route most of the way. Yeah, a lot of Andean mountains. After a few months on the South Pacific islands and atolls you develop a certain craving for the mountains again. I might change my mind rapidly once the cruel ascents start. The really look steep as Hell here from Santiago at 500 mas. Steep and tempting. Oi! Thomasinho. Brazil’s been my Achilles’ heel in this planning period. As much as I love (and always will love) Brazil and would love to revisit a Terra Marravilhosa, I find it hard/impossible to work out a reasonable bike route through SA (to Central America) that does not do too much boogie-woogie across the continent. But still – think about it… How many guys or girls in our, or any age, can sit there and honestly state: “Unless I would do a “little” loop through across AR to BA, Uruguay, southern Brazil, Paraguay and back to northern Argentina and then continue to Bolivia etc. (still an option, really)”? … That is freedom my friend and much more of a luxury than can ever be bought… Really really inspirational – and thanks for keeping us all in that loop! See you in the loop. Hi Steven…Yeah, I’ve used Google Maps. E.g on the front page of my site under the intro text (there are links in the text to route maps). Thanks for the suggestion! We are in Paraguay right now, heading South Brasil, Uruguay, South Argentina than. No, it´s such a bummer that we didn´t get to meet on the road (this time). Practically, I guess it´s just a matter of taking another “big loop” before we´d finally meet on the road. My friends and i are thinking of doing a similar trip ourselves. How long do you think yours will take? Just biking. Boat/plane when water. Simple, right? Wish I had met you, I envy you, I am Jealous. I am going to peru in Sep. in los Andes trekking. I will be back by Bolivia maybe.